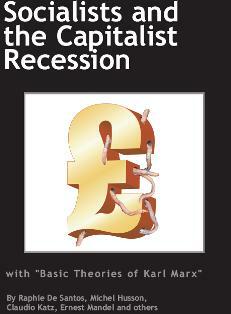 This 216-page book brings together much of the most powerful socialist analysis of the recession. Sean Thompson shows how neoliberal globalisation has an inbuilt tendency towards deflation. As explained in the article by François Sabado, the period since the turn of the century has been a disaster for American capitalism; first the catastrophe in Iraq and of the Bush government in general, and now an economic collapse that has completely undermined neoliberalism's 'Washington Consensus'. The ideologues of capitalism are on the defensive. But the Marxist explanation of the crisis has to be hammered home. Who caused this crisis? Why did it occur? What is it in capitalism that leads to the globalisation of poverty while a tiny elite become mega-wealthy? And what are possible alternatives? This book is a signal contribution to making those arguments. To give the socialist analysis in this book strong foundations, the book also includes ‘The Basic Ideas of Karl Marx’, an outline by Ernest Mandel of the core ideas of scientific socialism. The book will be launched in London next month. But you can pre-order your copy from us for the special price of £7.50 including postage inside Europe. The volume is also available as issue 39/40 of the International Institute for Research and Education's Notebooks for Study and Research (ISSN 0298-7902). Leonard Nikani's autobiography, My Life Under White Supremacy and in Exile, is the next book to be published by Socialist Resistance. These memoirs give a graphic portrayal of a black man growing up in racist South Africa. Click here to read about next week's London book launch. Leonard began to question the racist system while still at school. The Haymarket Books list is now available from Resistance Books. Click here for their full list with images and perfect formatting. Please send your cheque, payable to Resistance, to us at PO BOx 1109 London N4 2UU. Please add 10% for postage. 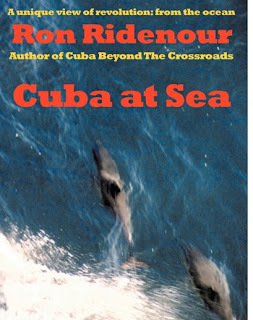 Ron Ridenour, whose book 'Cuba: Beyond the Crossroads' came out in an expanded edition last year, has published a new book with Socialist Resistance: Cuba at Sea. Thanks to photographs by Ron and his colleagues, the 108 pages of this book (plus four blank pahes for notes) are enlivened with 17 beautiful images. The images are made more powerful by the large, Crown Octavo, page sizes (twice the page size of a popular paperback). Readers of Resistance Books will already have appreciated this larger page size with our reprinting of Karl Kautsky's book. The book will be launched at an Oxfordshire book fair in mid-May, but is available now by mail-order. Copies cost 8 pounds, including postage, from 'Resistance', PO Box 1109. London N2 2UU. 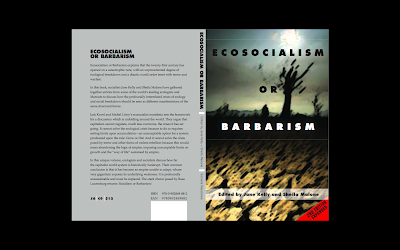 One of our best-selling books, 'Ecosocialism or Barbarism', will come out in an expanded second edition later this month. You can click on the image above to get a better look at the cover. The number of pages is up, to 176, and the price is down, from 10 to 6 pounds. A number of typographic corrections have been made in the book, and a major new section has been added: a resolution on 'Savage Capitalism' which explains the perspectives of the British ecosocialists. The draft of this resolution was published late last year by International Viewpoint. Respect as it was originally constructed - as an alliance primarily between the Socialist Workers Party (SWP) and George Galloway - is dead. Our next book explains why. 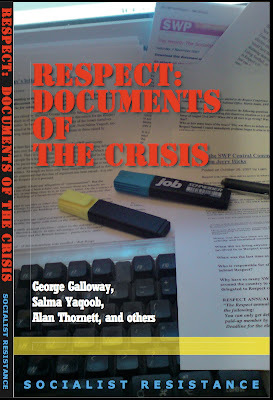 Contributors to 'Respect: Document of the Crisis' include Geirge Galloway, Salma Yaqoob, Alan Thornett, Chris Harman, Andy Newman, Kevin Ovenden, John Lister, Jerry Hicks, Liam Mac Uaid, Phil Hearse, Linda Smith, 'Socialist Worker' New Zealand and Nick Wrack. The introduction to this 140-page book explains that "Respect stood on the gains of the anti-globalisation and antiwar movements, and on the fact that the anti-war movement had begun to build among sections of Muslim communities who had not previously engaged with British politics. "But the SWP is painting a dishonest picture of what lies behind the division within Respect. They claim that they are the left in the split and everyone else is on the right (or is naively misguided, which is just as insulting). They repeat their disgraceful attacks on the Scottish Socialist Party, and by implication make comparison between those who support Respect Renewal with those in Rifondazione who have backed Italian Prime Minister Prodi in sending troops to Afghanistan. Such comparisons are ridiculous. "Disregarding the grandiose comparisons with the splits between the Mensheviks and the Bolsheviks for the delusions they are, this pamphlet shows the political positions of those the SWP would paint as "the right". "Not all the contributions we print here are from Socialist Resistance supporters, of course. But we think and hope that by publishing this collection we can contribute to an important debate, and thus help to build a socialist alternative to the ravages of war and neo-liberalism." The book will be available from Socialist Resistance sellers after January 26th for 3.50 pounds or US $7. In February, the book will also be available at Amazon.co.uk and other online bookshops. Using the ISBN number, 978-0-902869-89-9, you can also order from any bookstore.